A new era in Massachusetts elections began today with early voting offered for the first time. Local election officials report an upswing in people registering to vote in Massachusetts ahead of today’s deadline. Election Day is coming right up. In today’s Congressional Corner, WAMC’s Alan Chartock continues his discussion with Connecticut representative Joe Courtney, a Democrat from the 2nd district. Former Vermont governor and presidential candidate Howard Dean will be in Pittsfield, Massachusetts Sunday for a talk on America’s future. The Democrat plans to discuss this year’s national elections and more. Dean, a Hillary Clinton supporter, spoke with WAMC about the generation of Americans born after 1980 and their influence on the country. A Republican hasn’t carried New York in three decades. In today’s Congressional Corner, New York Congressman Paul Tonko, a Democrat from the 20th district, tells WAMC’s Alan Chartock why he doesn’t think that’ll change anytime soon. Give Us the Ballot by Ari Berman offers the first comprehensive history of its kind, and provides new insight into one of the most vital political and civil rights issues of our time. A candidate in one of this year’s high profile elections in western Massachusetts has dropped out and endorsed a former rival. Election Day is about four months away. In today’s Congressional Corner, Congressional Quarterly’s David Hawkings and WAMC’s Alan Chartock discuss the presidential race. More than 20,000 first-time voters have registered with New York state in what state officials are calling an "unprecedented surge" of voter interest ahead of the state's April 19 presidential primary. Villages across New York are conducting elections today. In 1963 Richard Hofstadter published his landmark book Anti-Intellectualism in American Life. Today, Matt Lewis argues, America's inclination toward simplicity and stupidity is stronger than ever, and its greatest victim is the Republican Party. His new book is Too Dumb to Fail: How the GOP Betrayed the Reagan Revolution to Win Elections (and How It Can Reclaim Its Conservative Roots). Most members of Congress are gearing up for their reelection campaigns. In today’s Congressional Corner, New York representative Sean Patrick Maloney tells WAMC’s Alan Chartock he prefers a competitive district. As voting begins in a few days in the 2016 Presidential Campaign, Vermont Senator Bernie Sanders may be the least political person in politics. But, he is leading Hillary Clinton in many polls. He’s closed the fundraising gap, and is drawing crowds of thousands to campaign rallies. Why? With reporting from inside the campaign, personal relationships with Sanders’s friends and colleagues, and meticulous research, reporter Harry Jaffe offers a portrait of the ultimate outsider candidate, charting Sanders’s course from Brooklyn to Burlington, and now to Des Moines and beyond. Harry Jaffe is a journalist covering Washington, DC—its politics, its crime, its heroes and villains. His new book is Why Bernie Sanders Matters. With the first votes just weeks away, the polls are tightening. In today’s Congressional Corner, Union College political science professor Brad Hays tells WAMC’s Alan Chartock what he thinks Bernie Sanders’ chances are. 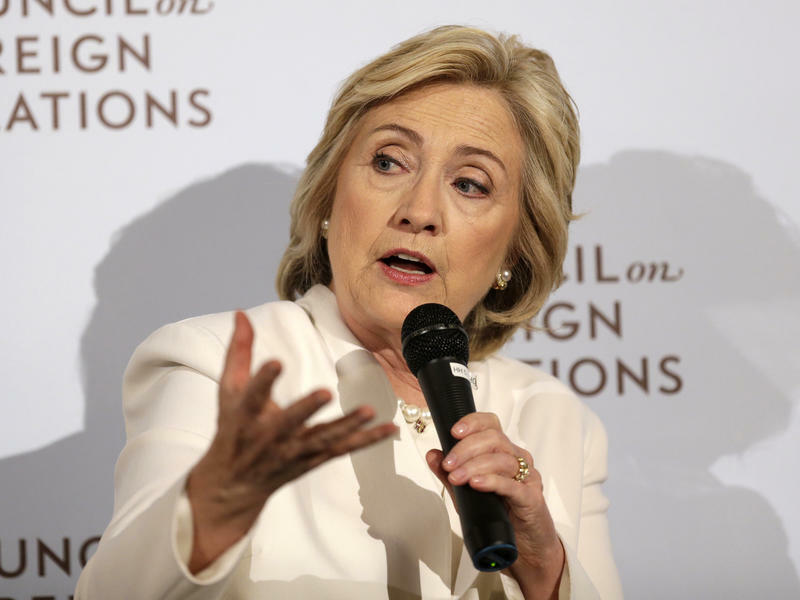 Hillary Clinton has revealed how she would fight ISIS in the wake of the attacks on Paris. Among her ideas: a no-fly zone, support for local troops, and a new authorization for the U.S. to use force in the region. In a Thursday speech, the former secretary of state laid out her plan, as well as some attacks on her Republican opponents. Political consultants, pundits, and politicians paid attention to the off-year municipal elections in western Massachusetts Tuesday for clues to what voters are looking for heading into 2016 with the presidency and many federal and state offices at stake. There were few surprises, or even close calls, for most of the mayors running for re-election Tuesday, but that does not mean they had an easy time of it, according to Springfield-based political consultant Tony Cignoli. Ask any politician about poll results and they will likely say that polls don't matter, especially if the numbers do not reflect well on their popularity or platforms. But polls did matter to the Republican candidates for president who wanted to be part of the recent Fox News debate, whose participants were chosen by poll results. The Marist Institute for Public Opinion at Marist College in Poughkeepsie did not want to be part of that debate selection process, according to Dr. Lee Miringoff, the director of the Marist Institute. Today is the day - Hillary Clinton is expected to officially announce her presidential campaign. A big send-off last night in Manhattan for the former first lady and one-time New York state senator as dozens of supporters, elected officials and Democratic leaders gathered at a fundraiser. The group has raised more than $15 million over the last two years and held events in all 50 states. Two senior advisers tell the Asscoaited Press Clinton will portray herself as a fighter who can get results in a tough political climate. Democrats took it on the chin in the midterm elections, but are hopeful about their 2016 chances. In today’s Congressional Corner, New York representative Paul Tonko tells WAMC’s Alan Chartock that the Empire State could play a major role in our national politics. November 2016 is a long way away, but the election has already begun. In today’s Congressional Corner, Congressional Quarterly’s David Hawkings handicaps the race with WAMC’s Alan Chartock.